The fact that I can’t remember a damn thing anymore has actually worked in my favor when it comes to getting recipe ideas from television. I can no longer get the exact ingredients down and so I wind up make stuff up as I go along. The end result: my own original take on a particular recipe. To make the mayo/mustard blend, combine 4 parts mayonnaise to 1 part mustard. You your favorite. I use Maiile Chablis mustard, but it’s only available in France. (See my previous blog about the Maille mustard shop in Paris.) However, Maille Dijon mustard is great, too. Set aside. In a bowl, gently mix all the ingredients. With your hands, form small crab cake balls, like meatballs. Place on a tray lined with foil, and pop in the fridge for at least 15 minutes to set. Heat oil in a pan to 375 degrees. Gently drop the crab cakes into the oil, and fry for only 10 to 15 seconds. Flip over, and fry 10 to 15 seconds more, just to form a light crust. Don’t over-fry or they will fall apart! 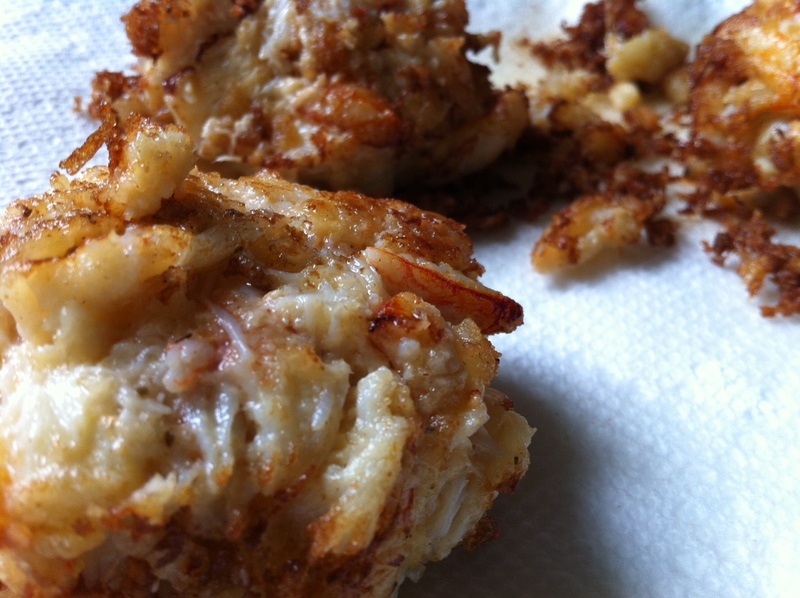 Drain crab cakes on paper towels and enjoy. Any leftover mayo/mustard works great as a tartar dipping sauce, or a spread if you’re making a crab cake sandwich. Just finely chop some pickles, add a splash of Worcestershire and/or hot sauce, and mix with the mayo/mustard. This recipe works equally well with a light, flaky fish, like cod. Combine mayo/mustard mix with Old Bay. Slather the fish in it, then roll the fish in the crumbs and fry in oil. Don’t let the fact that your brain isn’t what it used to be get you down. Take advantage of it! You just might come up with an original recipe that blows the doors off anything you copy down word for word.